Former NHL "tough guy" Bob Probert, who logged 3,300 penalty minutes for the Detroit Red Wings and Chicago Blackhawks during a NHL career that ran from 1985-2002, is now getting a taste of Hollywood thanks to a small role in The Love Guru the new Mike Myers hockey-themed movie to be released on June 20. Former Detroit Red Wing Bob Probert knows more than a little about being a star. During his NHL playing days, Probert was the main attraction whenever he came to town with either the Red Wings or the Chicago Blackhawks during a career that ran from 1985 to 2002. As the premier heavyweight fighter of his generation -- a generation that embraced the fistic element of the game -- Probert was a must-see attraction. In 935 games, Probert finished with 3,300 penalty minutes -- the fifth-highest total in NHL history. He also scored more than 40 points in a season four times and played in the 1988 NHL All-Star Game. Now, thanks to his involvement with The Love Guru, the new Mike Myers hockey-themed movie to be released June 20, Probert knows a little bit about what it is like to be a true Hollywood star. The Love Guru stars Myers as Pitka (Myers' first original character since Austin Powers), an American who was left at the gates of an ashram in India as a child and raised by gurus. He moves back to the United States to seek fame and fortune in the world of self-help and spirituality. His unorthodox methods are put to the test when he must settle a rift between Toronto Maple Leafs star Darren Roanoke (Romany Malco) and his estranged wife. After the split, Roanoke's wife starts dating Los Angeles Kings' star Jacques Grande (Justin Timberlake) out of revenge, sending her husband into a major professional skid -- to the horror of team owner Jane Bullard (Jessica Alba) and coach Cherkov (Verne Troyer). Pitka must return the couple to marital nirvana and get Roanoke back on his game so the team can break the 40-year-old "Bullard Curse" and win the Stanley Cup. In the movie, Probert has a small part where he plays a character named Armstrong, who plays for the Kings. While his part may be small, Probert spent more than two months filming in and around the Toronto area. That extended period allowed him to rub elbows with some of Hollywood's bigger stars, including Timberlake and Troyer. Jessica Biel, Timberlake's real-life girlfriend, also visited the set for close to a week. "It was actually a great experience," Probert said. "I had the opportunity to meet some movie stars throughout my career -- especially in Chicago. Guys would come down to the dressing room after games and things like that. But actually being that close and experiencing it on a set like that was totally new for me, and it was just fun being around some of them." 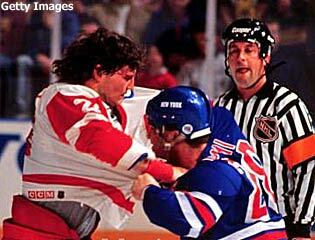 Probert made the most of the opportunity, too. He made sure he met as many people as he could and came away impressed. He was also a little surprised at how much the Hollywood stars knew about his own time in the spotlight. "I was like, 'Wow, that's weird, this guy knows who I am. That's kind of trippy.' I guess there are a lot of people back in the day that enjoyed the scraps, and I guess I am one of the people they remember." Troyer, of "Mini-Me" fame, also was taken with Probert. "Mini-me was a super guy," Probert said. "He's actually from Michigan and he's a big Red Wing fan. "He's not very tall, eh. The way I describe it to my kids is, I have size 14 feet and if I stack them on top of each other, that's how tall he is. He has a box he stands on and it's painted red and it's got a big Red Wing on it. When I first met him, he mentioned how he grew up watching the Red Wings and myself and he was a big fan. He was just an awesome, awesome guy." While it was nice to meet those two bold-faced names, Probert also made sure he got the opportunity to meet Biel. Actually, he made sure that opportunity happened. "I went over there and introduced myself and got a picture with her," Probert said. "She was very nice." 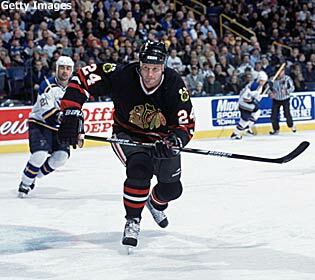 But make no mistake; Probert was there to work, first and foremost. He was one of the primary go-to guys used by Mark Ellis, the producer who choreographed all of the film's hockey action. Ellis was mandated by Myers to make the hockey scenes look as realistic as possible throughout the film. As a result, Ellis recruited 75 players -- from ex-college players all the way to former NHLers -- as extras on the film. Though Probert does not have much experience as an actor, he felt right at home when it came time film the big fight scene in "The Love Guru." Probert happened to be in Toronto one day, heard about the film through a friend, Jimmy Thompson, and asked how he could get involved. Ellis was ecstatic to have a former NHLer of Probert's background at his disposal. "Just a laid-back, great guy," Ellis said. "A leader, a guy that's fun to be around. He's another guy that you want in the locker room. A guy that can help these young kids. Bob always kept the right tone. He was the first one out of the room and on the ice and everybody followed him." Except, of course, when it came to filming the big fight scene in the movie. Then, Probert's reputation definitely preceded him, says Ellis. "We had a big fight scene in the movie, and those things are so hard to choreograph," Ellis said. "When we were rehearsing it, we just said 'everybody go on the ice, everybody just team up with somebody and we'll just talk about how each individual fight is going to go.' For some reason, when we rehearsed it the first time, nobody wanted to team up with Bob -- which I could understand. So we had to draw the short straw and some young kid ended up with it." That young man got a story to tell his buddies, it turns out. "There was one scene that I happened to get one of the smaller guys on the Leafs and there was a brawl scene that took place to the right of Justin Timberlake," Probert says. "I was supposed to make it as realistic as I could and knock his helmet off. Anyways, it was an uppercut and I kind of dinged him in the eye and he was sporting a shiner for the next week or so. "He was kind of happy about it. He was like, 'Look what I got from Probie.' He had the bragging rights that he took a punch from me, and I thought that was pretty funny." There were a lot of laughs to be had on the set, but there were also extremely long days. Probert says filming was done in four- or five-day stretches, with each day lasting 12 hours or more. They filmed at General Motors Centre in Oshawa -- home of the Ontario Hockey League's Oshawa Generals -- and the Air Canada Centre, home of the Maple Leafs. But in the end, Probert was happy for the chance to become a movie star -- no matter how minor or how brief. In fact, he has already landed another cameo, this one in the Canadian TV series "Rent-A-Goalie."
. "It was definitely a new experience for me. It was the first movie I have ever been involved in. There were a lot of long days and a lot of waiting around because they have to shoot so many scenes and they didn't need all of us. But it was still a neat experience. “It was a lot like being in a NHL dressing room again -- guys playing jokes on one another and pranks on guys. We just made it as fun as possible to make the time go by."